Dear World opened on Broadway in 1969 to mixed reviews. 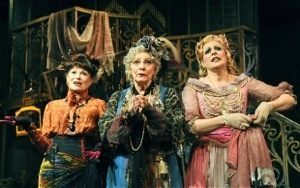 However, the show earned Angela Lansbury a Tony Award for her performance as Countess Aurelia. 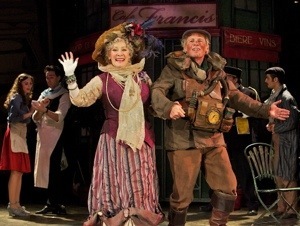 After more than 40 years this musical now receives its UK premiere at Charing Cross Theatre. The show is described as a musical fable which gives a first hint that this might not be your typical musical theatre story. It focuses on the Countess Aurelia and her friends who are trying to stop a group of businessmen from destroying Paris in their search for oil below the city. Sounds a bit odd you think? Trust me, odd doesn’t even come close. This show is by far the most bizarre thing I have seen on a stage in a long time. However, I ended up finding the whole experience strangely entertaining. This is without a doubt due to a wonderful cast who does the absolute best with the material they’ve been given. 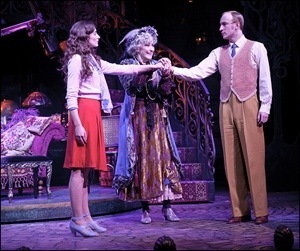 The cast is lead by Betty Buckley as Countess Aurelia. The chance to see one of Broadway’s most legendary leading ladies on stage in such an intimate venue definitely is worth the ticket price alone. Her performance is flawless and a pure joy to watch. The same goes for Stuart Matthew Price who plays Julian, a young man who starts out as an assistant to the businessmen but ends up helping the Countess and her friends save the city. In my eyes Stuart is one of the most talented young performers in London and it’s fantastic to see him share a stage with Betty Buckley. Julian’s love interest Lisa is played by Katy Treharne who does a marvellous job. Paul Nicholas shines as the Sewerman – pity the part itself is probably the weirdest in the whole show. One of my personal highlights is Rebecca Lock’s Gabrielle and her imaginary dog Dicky – pure comedy genius! This show could be a hidden gem if it wasn’t for the completely random storyline. Yes, it does have its funny moments and it is entertaining for most of the time. However, in its current manifestation I doubt this musical will ever appeal to a wider audience. It is simply too strange and leaves the paying public with too many questions – the main one being: How is it possible to come up with a show like this? Still, if you get the chance and you want to see a proper Broadway legend together with an all around talented cast perform in a lovely little venue, then please give this show a shot. Dear World is playing at the Charing Cross Theatre until 16th March. For more info and to book tickets go to http://www.charingcrosstheatre.co.uk/.